Volkswagen is the first automaker worldwide to offer a model line with a full range of conventional and alternative powertrains. The new Golf GTE plug-in hybrid, which will be presented at the Geneva International Motor Show (March 4 to 16, 2014) is the fifth powertrain to be offered in the Golf, adding to gasoline, diesel, CNG and full electric versions. The Golf GTE has an NEDC hybrid combined fuel economy rating of 157 mpg (equivalent to 35 g of CO2) and has an all-electric range of 31 miles along with an overall range of 584 miles. GTI, GTD, GTE. The Golf GTE name is in line with the GTI and GTD abbreviations-two sporty icons of the Golf range. The first GTI in 1976 invented the term "hot hatch" and is currently the most successful compact sports car in the world. The "I" in the name stands for electronic fuel injection while the "D" in GTD, introduced for the first time in 1982, stands for diesel fuel injection. The latest versions of these two best-selling Golf sports cars were introduced in 2013. Now Volkswagen has transferred its sporty compact car philosophy to a third model-the Golf GTE. The new Golf GTE has two engines: a1.4-liter148 horsepower turbocharged and direct-injection TSI® engine and a 101 hp electric motor. These combine to provide the stated system power of 201 hp. 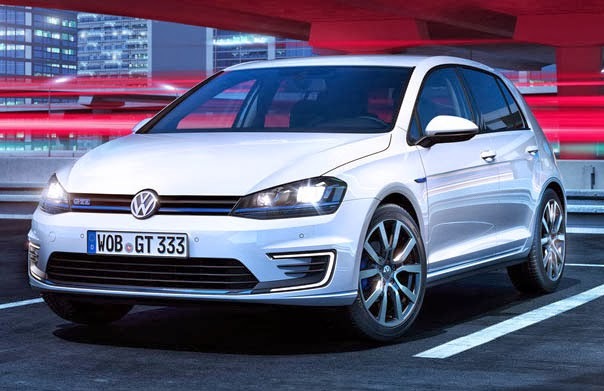 If the electric motor is the sole source for propulsive power, the Golf GTE is capable of speeds of up to 81 mph. When the full power of the system is harnessed, the GTE sprints from 0 to 62 mph in 7.6 seconds and achieves a top speed of 135 mph on the autobahn and race courses. Of more significance is the superior pulling power of the Golf GTE thanks to its alliance of a gasoline engine and electric motor that produces a maximum torque of 258 lb-ft. This torque sets this first "GTE" apart from other plug-in hybrid models. Despite its power and torque, the Golf GTE remains one of the world's most efficient cars. If you mainly run short distances, you can drive in emissions-free all-electric mode for days, weeks, and months. The battery takes about three and a half hours to charge fully from a conventional wall outlet. As mentioned, the new Golf GTE is driven by a 148-hp TSI turbocharged and direct-injection gasoline engine and a 101-hp electric motor. The electric motor is supplied with power from a high-voltage 8.8 kWh liquid-cooled lithium-ion battery that is charged from a socket behind the VW logo in the radiator grille. The battery weighs 265 pounds, or about eight percent of the GTE's 3360-pound curb weight. The GTE has a six-speed DSG® automatic transmission that was developed specifically for hybrid vehicles. Volkswagen integrated the electric motor in the transmission housing. Additional hybrid drive components also include the power electronics (which converts the battery's direct current to alternating current for the electric motor) and a charger. An electro-mechanical brake servo and an electric air-conditioning compressor safeguard optimal and energy-efficient operation of the brakes and air conditioning, especially for the GTE's "e-mode". The Golf GTE can be driven in various intuitively named modes. For instance, the driver can push a button to intentionally switch to the "e-mode" which makes the Golf GTE a zero-emissions vehicle. The driver can also use the button to switch to "GTE mode", which activates the sporty side of this new Golf. Exterior. Volkswagen Head Designer Klaus Bischoff's crew created a look that merges GTI insignia with those of the e-Golf, creating an unmistakable identity. Klaus Bischoff explains the differences: "The presence of the electric drive is visually expressed by the prominent C-signature of the daytime running lights on the Golf GTE. Meanwhile, all other front design elements bridge to the GTI." In those places where red dominates on the GTI, blue is used in the GTE. Bischoff continues: "A radiator crossbar running into the headlights provides further sporty accents within the context of Volkswagen electric mobility." Like the e-Golf, the four-door Golf GTE will launch with LED dual headlights as standard. The turn signals, parking light, and smoked numberplate lighting also use LED technology. Side skirts and a roof-edge spoiler provide further parallels with the GTI and GTD. Meanwhile, the aerodynamic 16-inch (standard), 17-inch, and 18-inch aluminum-alloy wheels were designed especially for the GTE. Interior. Like the exterior, the sporty interior of the Golf GTE reveals a clear relationship to its other two GT series counterparts. However, just as on the exterior, the interior's red accents have also turned to blue. Klaus Bischoff says: "Volkswagen's e-mobility color of blue creates attractive contrasts in the car's seating, decorative seams, and material design. Moreover, the blue ambience lighting builds a visual bridge to the world of e-mobility." The light blue decorative seams on the leather-wrapped steering wheel, on the edges of the floormats, on the seats, and on the shifter grip are perfectly matched with the exterior features of the Golf GTE. Touchscreen. All Golf cars are equipped with a touchscreen. In the case of the Golf GTE the high-resolution 6.5-inch "Composition Media" radio system is standard. The "Discover Pro" radio-navigation system is available as an option. Both units are equipped with many additional functions on the GTE. These include a "driving range monitor", an "energy flow display", "zero emission statistics", "e-manager", and-with the optional navigation system-the "360° driving range". Additionally, all Golf GTE owners can download the "Volkswagen Car-Net e-Remote" app to their smartphone free-of-charge and use it to control functions and access information. 360° range: the current radius in "e-mode" is shown by the 360° range in the local map. The inner area shows the range for an outward and return trip, the outer area the range for a one-way drive. Charging stations can be displayed and incorporated in the route as intermediate stopovers. Car-Net e-Remote. Using the "Volkswagen Car-Net e-Remote" app it is also possible to make several of these settings and requests for information via a smartphone or the Car-Net website. In detail, the app can program the departure time, air conditioning, charging the battery, accessing vehicle data, and the vehicle's status. Power meter. The power meter supplements the tachometer on the left-hand side of the instrument cluster; it displays how much system power is currently being used or the intensity of battery regeneration. The speedometer remains on the right-hand side. The color display which is located between the power meter and the speedometer (multifunction display "Plus") also permanently shows the electrical driving range and the current operating mode.